Preheat the oven to 400° F and line a large baking sheet with aluminum foil. Cut the cleaned potatoes into wedges of the same size so they cook evenly. Place the cut wedges in a bowl or pot and cover with very hot tap water while you prepare the dressing. You can skip this step but rinsing away starch from the potatoes makes them even crispier. Drain the wedges very well then toss them in the bowl with the dressing. Coat each piece with the dressing. Place the wedges on the cookie sheet flat-side down. Bake for 40 minutes then turn on the upper element to broil the other side of the wedges for another 10-20 minutes or until golden, crispy brown. Make these potato wedges whenever the French fry craving strikes! 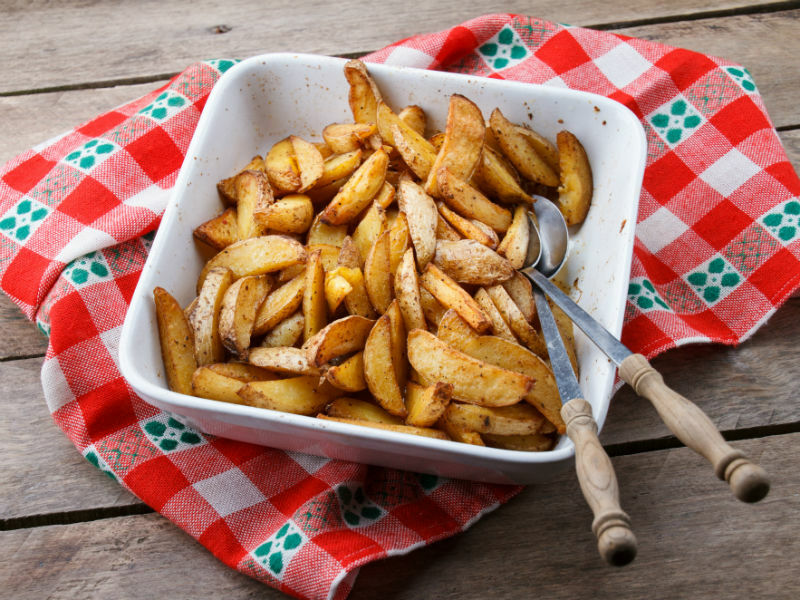 A smaller serving of fresh or frozen French fries has at least 35% more calories than the potato wedges in this recipe.